Rob van Mesdag. Photo: London Rowing Club website credited to Jeremy Hudson. The tightknit argumentation of rowing historians has lost one of its finest members with the death last week of Rob van Mesdag (18 January 1930 – 18 July 2018). HTBS hopes that a suitable obituary will soon be published but felt his passing should be acknowledged promptly. If you have a memory of Rob, you are warmly invited to share it in the comments section. Rob was born in Hilversum in the province of North Holland, Netherlands, a country that he represented admirably in the 1950s. 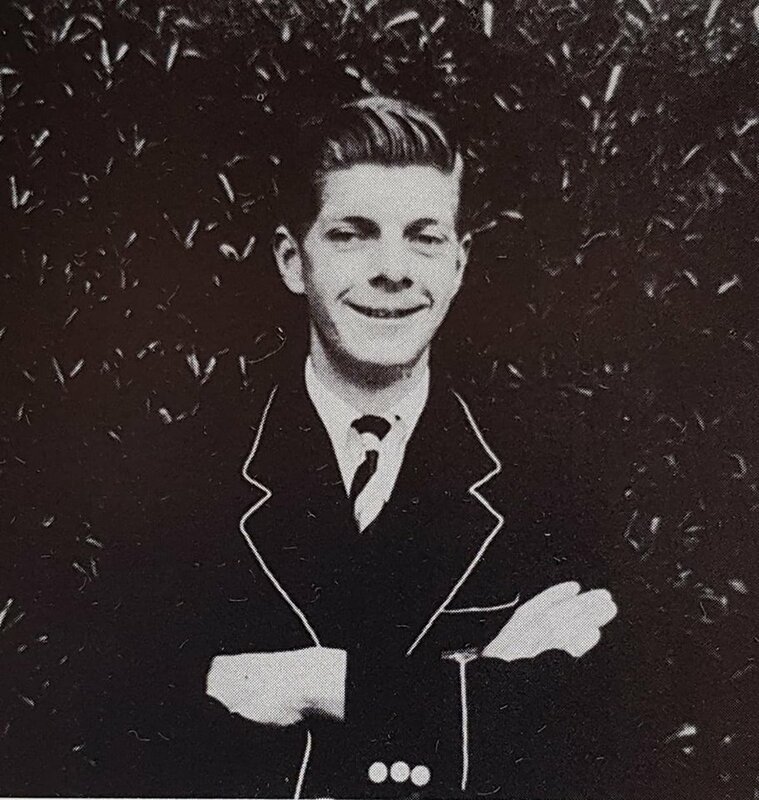 In the 1940s, he attended St. Andrew’s School, Delaware, USA, a school that he rowed for and remained in contact with for more than 70 years. According to John Dak Morton, Rob sponsored the St. Andrew’s Alumni Racing crew twice at Leander Club for the Henley Masters’ Regatta in 2010 and 2017. A young van Mesdag in his Dublin University Boat Club blazer. Photo: In Black & White (by Raymond Blake). Mesdag, who had faced A. D. Rowe of Leander Club in the final of the Diamonds exactly an hour before. He was beaten by three lengths, but this could not take away from the gallant way in which he reached the final. Against his fellow Dutchman, C. T. Neumeier, in the semi-final, he sculled himself to a standstill, and just held on to win by three feet. It was a performance that endeared him to the aficionados amongst the Henley crowd, and it was a tribute to the single-minded perseverance and dedication which he brought to his training. In all, Mesdag sculled four times for the Diamonds, and although he never managed to claim a ‘Pineapple Cup’, he went close on each occasion, losing trice to the eventual winners and once to the beaten finalist. Internationally, he represented The Netherlands in the European Championships from 1951 to 1956, winning a bronze medal in 1955. He also raced at the 1952 Olympic Games in Helsinki and was perhaps at his peak four years later, but The Netherlands did not send a rowing team to the Melbourne Games. 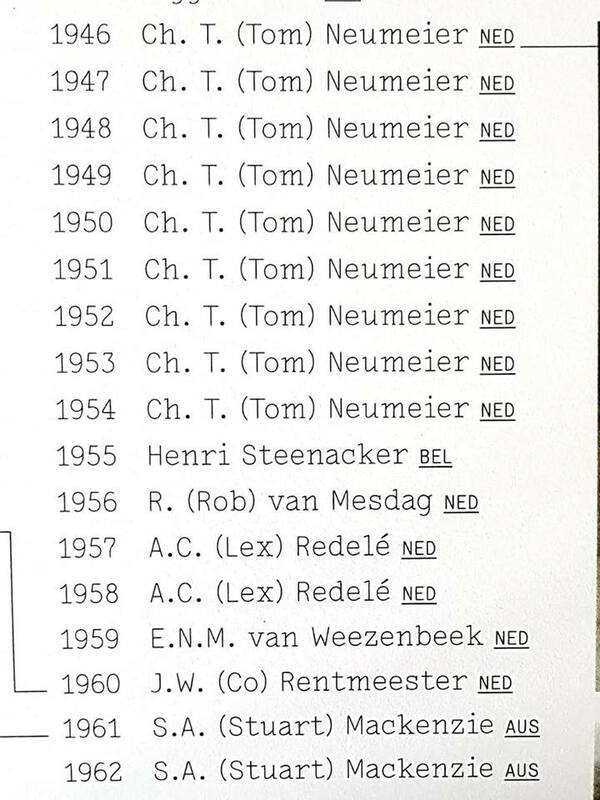 1956, the year Rob claimed the Holland Beker. The Low Countries were strong in sculling between 1946 and 1960. Photo: “Holland Beker 1886 – 2011”. Some you win. Is Rob wearing the colours of his home town club, Hilversumse Roeivereniging Cornelis Tromp (HRV Cornelis Tromp), the club he represented in the Diamonds in 1954? Rob van Mesdag won the Holland Beker in 1956. Perhaps this is the only video of him sculling although I understand that there is a recording of him racing in Helsinki in 1952. London Rowing Club, of which Rob was a long-time member, announced his death on their Facebook page and not surprisingly, dozens of tributes have been left in the comments section. Rob was a regular attendee at the bi-annual Rowing History Forums held in Henley-on-Thames since 2007 and often wore his Dublin University Boat Club colours to events. In fact, he presented two papers to the forum: Venetian rowing grows on you (2009) and From foetus to Olympian; student rowing in Holland (2013). It was at these events that I met Rob and knowing he was a distinguished alumnus of Trinity College we chatted about rowing in Ireland and his love of the club and Trinity Regatta. 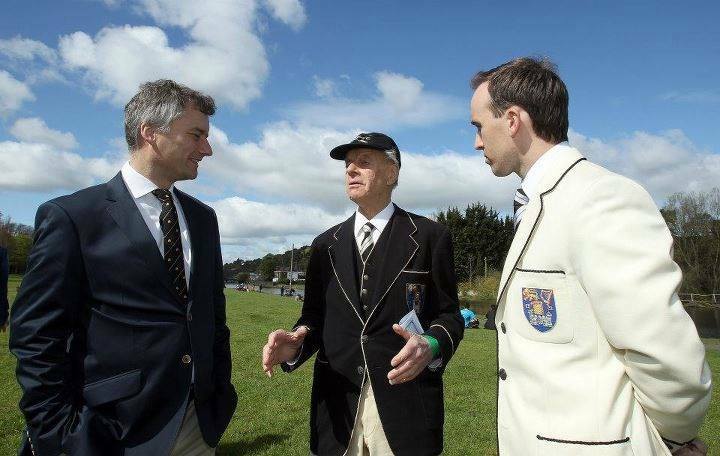 Holding court at Trinity Regatta, Islandbridge, Dublin, Rob explains how he beat C. T. Neumeier by three-feet, or was that a-foot-and-a-half, at Henley in 1950. Listening attentively are Provost Dr Patrick Prendergast and Regatta Chairman Barry Crushell. Photo: Barry James. When he found out I was from Carlow, he brought up my fellow Carlovian, Seán Drea, who won the Diamond Sculls in 1973, 1974 and 1975 in the colours of Neptune Rowing Club, adding a World Championship silver medal in the latter year. I thought I was on safe ground to give him the benefit of my knowledge on Seán until Rob told me that he had coached Drea when he had spent some time rowing out of London R.C. That was followed shortly by the sound of my jaw dropping. A recent photograph of Rob taken on 5 July in Amsterdam. Photo: “Roei!” credited to Merijn Soeters. 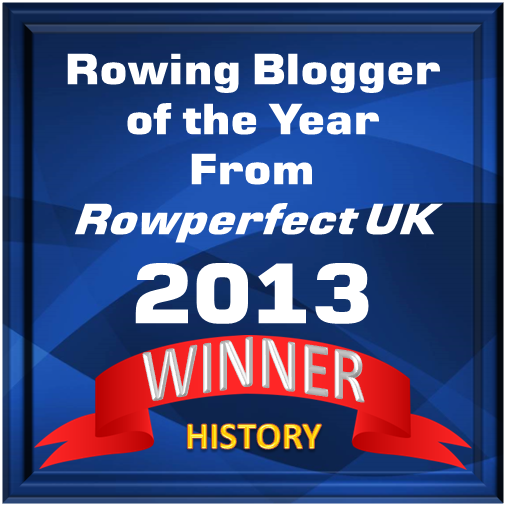 Last Wednesday, Rob collapsed on the Thames while getting into his sculling boat. He was doing a photo-op for a Dutch documentary unit that was putting together a special on his extraordinary life. He was rushed to hospital and died shortly after arrival. Details of his funeral arrangements and a full obituary will be published on the website of London R.C. 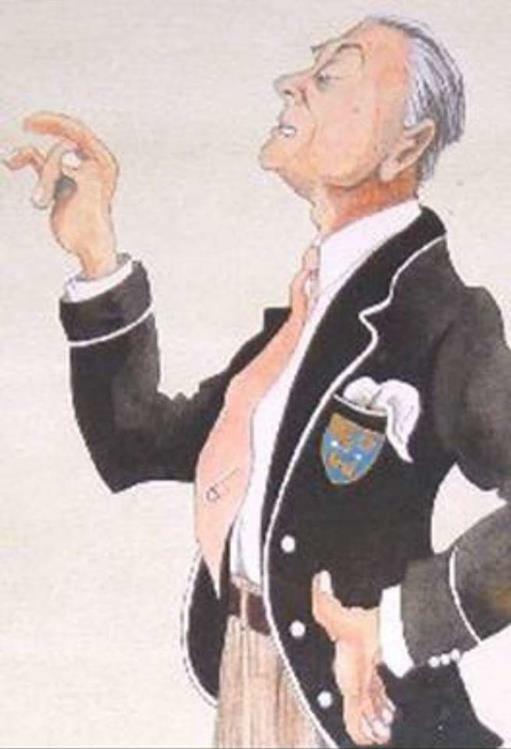 Dutch master, London style; Leander tie, Trinity blazer – a caricature of Rob van Mesdag by Keith Ticehurst (former Captain of LRC). An extremely sad passing for Trinity’s DUBC. 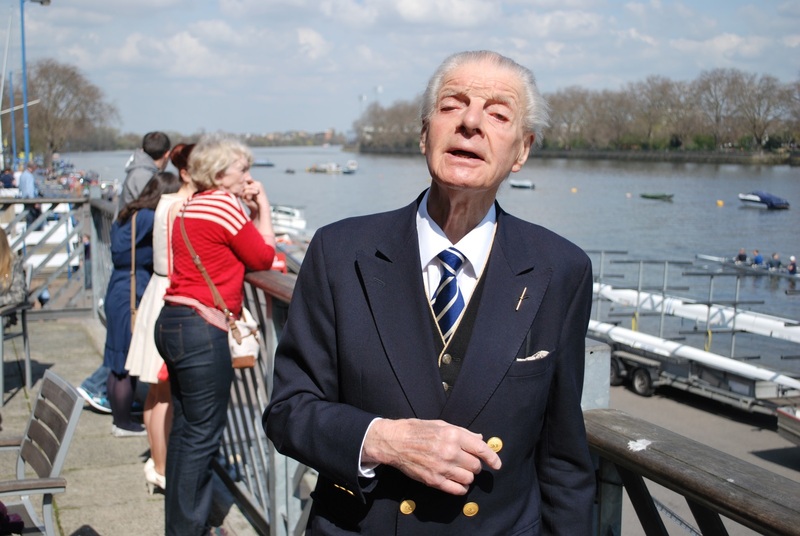 He was a wonderful fixture at every Trinity Regatta and Henley for well over half a century and sculled almost daily at London Rowing Club into very old age. I do hope that the Dutch film crew were almost finished their documentary. It is good to see that he was reasonably hail and hearty right up until his end and didn’t he really die the way he would have wanted to, beside his beloved companion, his original wooden sculling boat on the slip of LRC. He will be sadly missed, along with his wonderful archive of great stories. He was such a gracious gentleman of that old school who could have passed as English despite his Dutch, American and Irish perambulations. A top class oarsman and one of the nicest people you could ever have met. A long time supporter of and President of DUBC, an inspiration to generations of Trinity oarsmen, coach and legend. He will be sorely missed and is irreplaceable, but he will always be remembered with great love and fondness in the annals and lore of the club amongst figures such as the recently passed Robin Tamplin and Major CT Denroche of the WWI period. A link with the past has been severed, but he will live on in our minds in perpetuity. Robin Privett writes on behalf of the City Barge Boat Club of Oxford about the sad death of our renowned friend and member Rob van Mesdag. Rob was a friend to everyone, an enthusiast on the water and an excellent companion and entertainer. 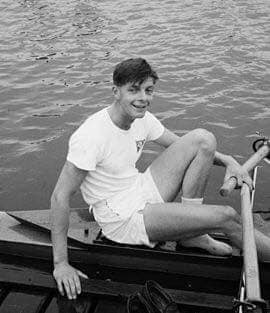 HTBS has already celebrated his rowing career in what we call the “sitting down” discipline. 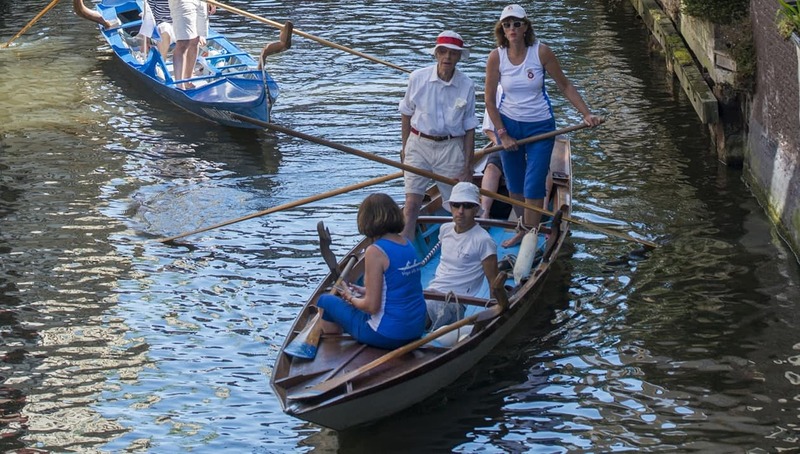 Your readers may not all know that he took to Venetian rowing (“standing” – a City Barge speciality) in his later years with equal facility and style; and one of his very last outings was at the Rally in Amsterdam of the CIVV (Comitato Internazionale di Voga Veneta) as recently as 8th July. The photo which you included in your RIP post shows him during that rally with Club members, in a Venetian sandolo. And finally, he was on his feet with many stories at the Rally dinner at the De Hoop Club. Rob was truly “a man of parts”, and will be much missed. P.S Tim Koch wrote a vivid article for HTBS last year on City Barge Venetian rowing. Standing up and looking where you’re going is not my area of rowing but I listened to Rob talk about it and as you well know he didn’t do anything by halves. A perfect example is his nearly thirty Vogalonghe. In addition he taught me and all the other attendees at the Rowing History Forums how to prounce De Hoop. Another news reel clip of Henley Royal Regatta 1950 including Rob in the final of the Diamonds. Rob’s ashes will be scattered on the Tideway on Tuesday 2nd October 2018, followed by a dinner in LRC, from 6 pm. His Memorial Service takes place at All Saints Church, Fulham at 2 pm the following day. In addition, Dublin University Boat Club will host A Service of Thanksgiving for his life of on Monday 24th September 2018 at 6 pm in Trinity College Chapel.